DO IT: Projects, Plans and How-tos - Get up and do something. Bitcoin is red hot right now. Like everyone, I’m full of silly regret for not having put all my savings into it when it was super new and dirt cheap — even a small investment at the start would be worth a fortune now. Instead, I waited a few years and bought 0.1 bitcoin for $100 when its price was at a then-peak of $1000. It promptly plummeted. Then, years later, it skyrocketed. With Bitcoin’s price flirting with $20,000 over the past month, I got curious to what could have been in various scenarios, mostly one where, instead of putting money into another platform that launched around the same time, Kickstarter, I had put the same amount of money into buying Bitcoins. We all know how much Kickstarter has transformed the world for creators and makers since it came out in 2009, allowing people to finance and market their ideas and help bring them to fruition. I’ve been a regular backer since 2011, with a collection of novel, backed items to show for it. A 74,400% gain — not too shabby, although with the current fervor I thought the final dollar amount would be even higher. You can see the best conversions were the earliest, of course, but would be way more if I had gotten in during mid-2010, when Bitcoin prices sat in the $0.06 – $0.08 range. Just the first $20 pledge done a year earlier would be worth over $4.8 million at today’s prices. This is nothing but a hypothetical exercise, unfortunately. Like all investments, there’s a huge element of chance involved in trying to boost your money through Bitcoin or any other high-risk cryptocurrency. Take it from someone who’s perpetually struggled with the stock market, there are no guarantees! 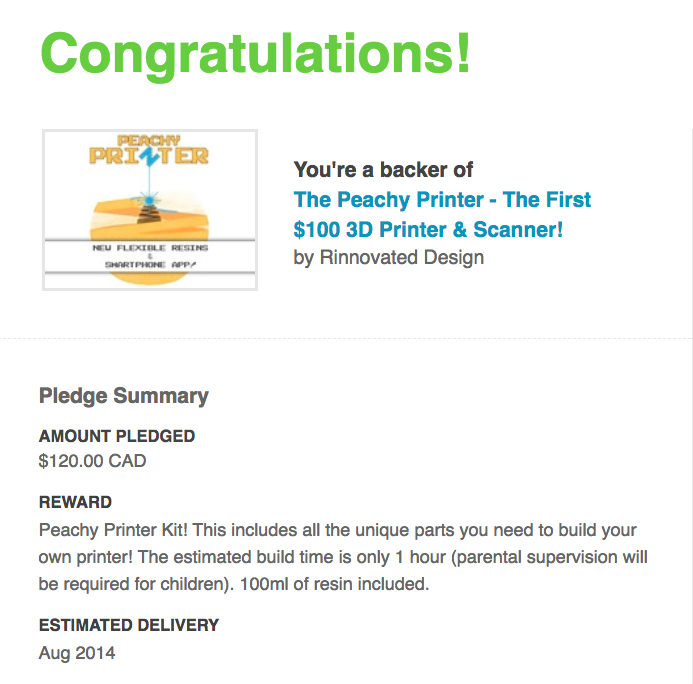 And I really don’t have regrets backing Kickstarters (except for the Peachy Printer, which evaporated with my money and everyone else’s). Some of these have been friend’s projects that I have been happy to be a backer of, and some of the items I’ve gotten have been useful on a daily basis. Most importantly, it’s good to support the economy of individuals who are pursuing endeavors not as easily possible before the platform existed. It’d be pretty interesting to make a tool that could automatically calculate your theoretical Kickstarter-to-Bitcoin (or APPL—BTC, GOOG—BTC, etc) wallet value, although I’m not sure Kickstarter has an API that would support the export of that info. Meanwhile, if you want to tally up your own amount, I found this chart to be most useful for finding daily Bitcoin prices, and I’ve put a blank version of my spreadsheet here — just make a copy for yourself and input the data. Let me know what yours would have been! Here’s some money I wish I hadn’t spent. My wife’s been asking for a propane grill for a long time, specifically the Weber Spirit E-210, so I surprised her with one for mother’s day. She loved it! Here’s the assembly, which took about two hours, condensed into a one-minute timelapse video. The instructions are straightforward and easy to follow, although I chose to ignore their warning to not use a powered drill for connecting the nuts and bolts. If you do the same, make sure to stop it as soon as it starts to torque so as to not break anything. I used a Bosch 12V impact driver (which I absolutely love) but was very soft on the trigger — it’s deceptively powerful despite its tiny size and I’ve stripped plenty of screws with it. Now that it’s built, all that’s left is to test it out. I’ve been skateboarding frequently over the past year, with a new park opening nearby that finally gives me access to a small halfpipe. 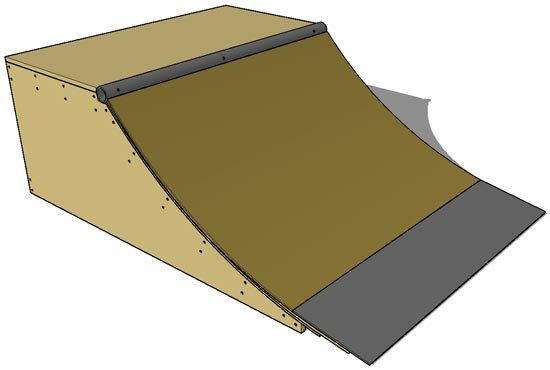 I skated a lot as a young teenager, and built a fun launch ramp that was popular at our local playground, but at that point, all local communities were terrified of the liability a proper local skatepark might produce. The only one in the Bay Area that I knew of was the old Benicia skatepark, which was amazing to go to but overall really wasn’t all that great. Later in high school, through college, and into my working years, I kept my skateboard around mostly for transportation, but never for tricks. Torn-up ankles from skating and basketball left me pretty uneasy, especially with anything that takes me off the ground including simple ollies. About three years ago,Just before my son was born, I decided to buy a new skateboard. I don’t know why — I’d been surfing for the past few years, and skating wasn’t on my mind at all. Perhaps I felt I needed something to make sure my son would know I was a pretty cool dude. I bought a board, but didn’t use it much. Then, about two years after that, I started going to Eric Kirkwood’s evening skate sessions at the awesome Prooflab ramp in Mill Valley. He’s a phenomenal instructor, and I began building back my confidence and learning to ride on transition. And, loving it. This led me to explore the new park near my house, which has since become a weekend ritual for me. It’s not a big park, and the miniramp is decidedly “mini” — only about 3′ tall, but still dauntingly tall for my level of experience. Not to mention the concrete surface seems so solid and unforgiving. Soon, I was getting comfortable dropping in, and not long after that, getting up the other side and turning onto my axles. But from there, I was stuck, unsure of how to get back into the ramp without catching my wheels on the coping and sending me face first to the bottom. I practiced the first part of this for a few months. Finally, one morning I resolved to learn to turn and drop in from axle, and managed to land two while remaining upright. But my other three attempts ended with pretty good spills, and one where a landed so hard on my heel that I ended up with crutches for a few weeks. Eventually I decided I needed something even smaller to practice the 50/50 axle drop-in motion from. 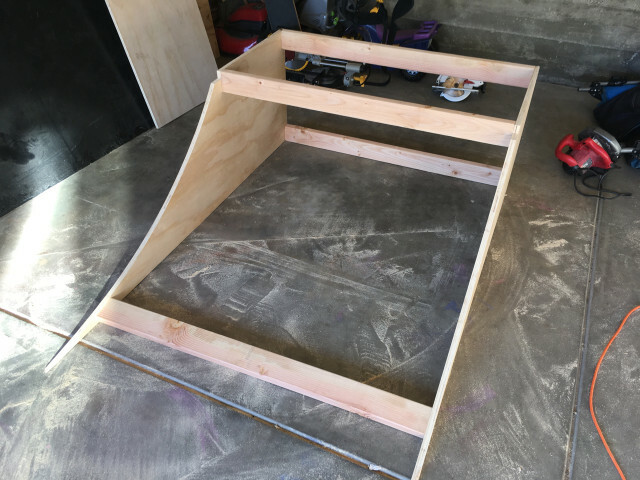 I found the micro quarter pipe ramp plans on DIYSkate.com, bought the materials from the local hardware shop (including a nice clean piece of plywood that cost me less than $30), and knocked the ramp together from their plans in an afternoon. 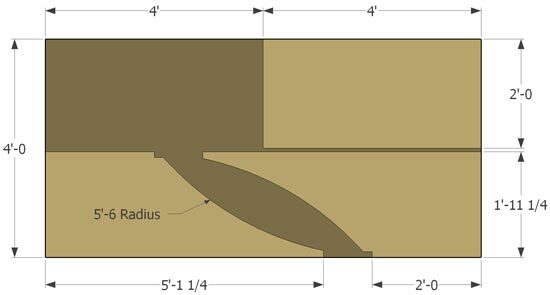 Their instructions are solid, but I did have trouble getting the first layer of plywood to bend to the curvature of the ramp (I layered three pieces of masonite on it instead). Also, metal pipe for coping is more expensive than what I set to spend on this ramp, so I settled for PVC. If it breaks, I’ll replace it, but with the objective of this ramp, I don’t expect it to endure much abuse. And, I’ve yet to find the metal threshold sheet at the bottom of the ramp surface. Regular drop ins are easy on this — it’s so short, but not uselessly small. From there, it took a few weeks of casual use to build up some courage to practice my 50/50 axle drop-ins. I started by deliberately doing them with only a 45º turn, then jumping forward and stepping down the ramp. After doing that a couple times, I pushed for a full turn, and nailed it. Did three more to be sure it wasn’t a fluke, then a few days later I went to the park with this move in mind, and got it on the second try — and since then, I’ve been pretty solid with it. 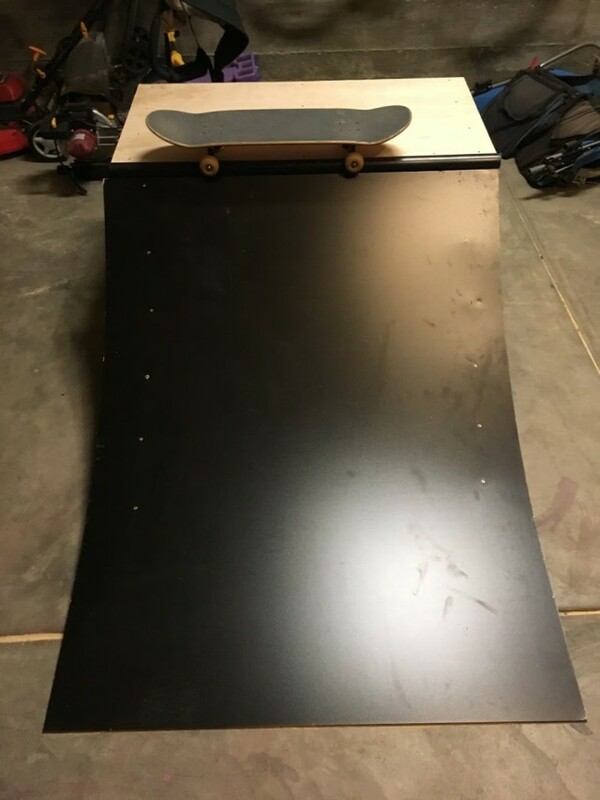 One surprise about the micro ramp is that it’s still quite big; I have it stored standing up on its end in the garage most of the time and it stretches pretty high in the air — maybe 7′ — and overall takes up a decent amount of space. I’m brainstorming ways to make it collapsable for really compact storage. I’ll post an update if that materializes. The Microdrone 2.0 is a pretty sweet little quadcopter. Surprisingly stable and cautiously responsive for its small size, it’s also able to whip around outdoors in a bit of a breeze, high in the sky. The unit I have, however, has an overly tight socket union for the powercord to the battery. So tight that a while ago, I accidentally yanked the wires out of the plug on the quadcopter. I’ve had this on my desk with intentions to fix it for some time, and finally found a few spare minutes this weekend to do so. First, rather than just crimp the old plug back on (which seemed unlikely to work well), I had purchased a new power cord with the appropriate plug connector on it. This isn’t entirely straightforward — lipo batteries have a number of different connector types and it took some internet sleuthing to feel somewhat confident about the one to order. When it arrived, I discovered the coloring of the wires is reverse that of the drone, something I decided to overlook. Despite having a batch of new tools to test out as well from Dremel (Versa-Tip butane soldering iron), Craftsman (12-in-one multitool), plus my Vise-Grip wire strippers (these are the greatest), and a can of Bernz-o-matic butane, I still didn’t have the right tool to do a perfect fix — I was missing a desoldering iron to get the broken wires out entirely and put the new one in through the Microdrone’s PCB, to help give them a long-term solid connection. So instead, I currently have the new wires soldered to the board on the surface, a fast, dirty, and inelegant fix that nonetheless got me back in the air in minutes, rather than putting off the repair for more days while promptly getting too busy to track down my desoldering tool. I did, however, make sure to doubly reinforce the new power cord with a dual layer of heat-shrink tube. This had an unintended consequence as it forces the wires to be very straight and stiff, but they still have enough give to connect to the battery. After the quick soldering job, I plugged in the battery and watched the LEDs blink back to life. Then I took this guy outside and raced it around the street for the rest of the afternoon. Too much fun. Galactic structures a billion, billion miles wide look like squirts of food coloring into a bowl of water with these tilt-shift photos. Typically used for architectural purposes, tilt-shift (or perception-control) lenses move the plane of focus from being parallel to the cameras’s sensor or film, and instead places it at an angle by physically tilting the lens itself. When applied to a landscape, the photographer can put a long, sweeping area into focus. But when used the opposite way, the focal plane narrows down into a thin band, horizontally spanning one part of the sensor. The unfocused top and bottom part of the photo are thrown out of focus. It’s a similar look to that of a macro photo, when something small is taken at close proximity and is only in focus in a narrow plane, because of the way lenses tend to work (especially those left at wide apertures). And while the tilt-shift lenses are pricey, a similar result can be created with simple photoshop or smartphone app filters. We’ve trained our our eyes and brain with these types of photos to the point that tilt-shifted images of large items, especially those taken from above at an angle, appear as though they are a macro photo of a small image. When done really well, the item shrinks from humungous size to that of a model miniature. These shots of some of the most famous cosmic bodies — Horsehead Nebula, Andromeda, etc — made to look like something you could reach out and wrap your hand around rather than something that spans lightyears of distance, using a faux tilt-shift effect in Photoshop. They come courtesy Imgur user ScienceLlama, and are some of my favorites yet, although I think the top honor still remains with the tilt-shift video below. Fantastic documentation of a 1974 Land Rover Series III restoration. Anytime you’ve got a heavily used utility vehicle that’s pushing close to four decades in age, you’re likely going to have a fair amount of rehabilitation work on your hands to get it into a reliable and comfortable state. Firman Ni of Indonesia chronicles the complete teardown and rebuild, with some after-restoration mud fun. Makes me want to loosen some bolts. 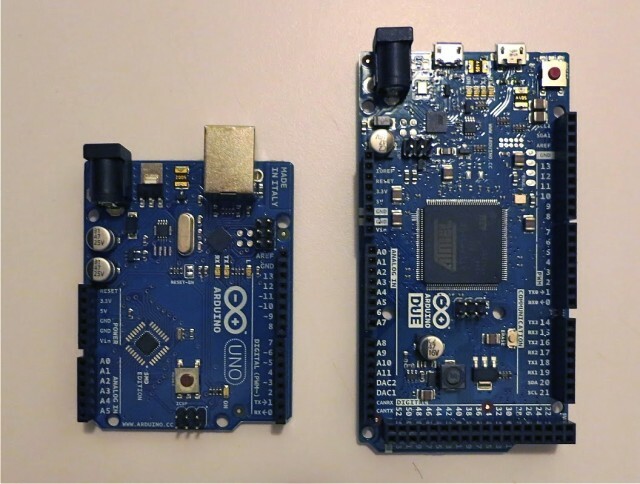 Earlier this week, the much anticipated Arduino Due microcontroller was released. Improved in almost every regard, the prototyping community is thrilled with the possibilities that it creates. The new boards are already shipping, and Jon Gottfried sent me some photos that compare its size with the ever-popular Arduino Uno. Gottfried, a Developer Evangelist at Twilio, has put together a few interesting Arduino projects of his own, including setting up a home automation system that let him control his AC remotely. He also sent photos of the new board with the Raspberry Pi and diminutive Arduino Fio for further size comparison. 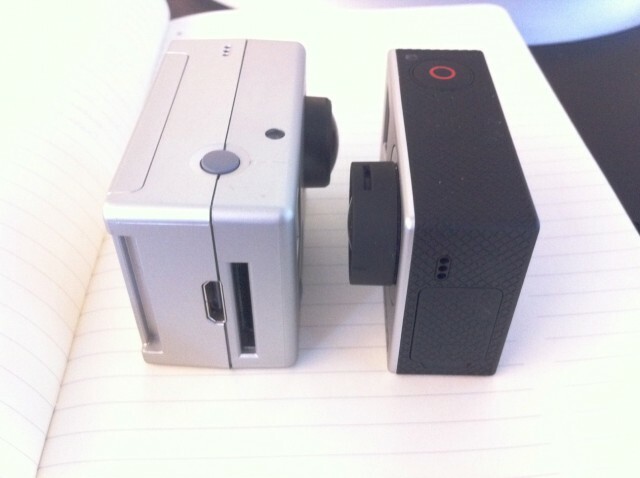 In addition to amazing specs, an improved lens, and cool new connectivity options like wifi control (that seem to actually be arriving this time), the GoPro Hero3 shaves 30% from the already svelte body of the Hero2. It actually makes the older Hero look like an outdated, clunky dinosaur. Check out this side-by-side pic for a comparison. This camera just popped onto the top of my “must have” list. 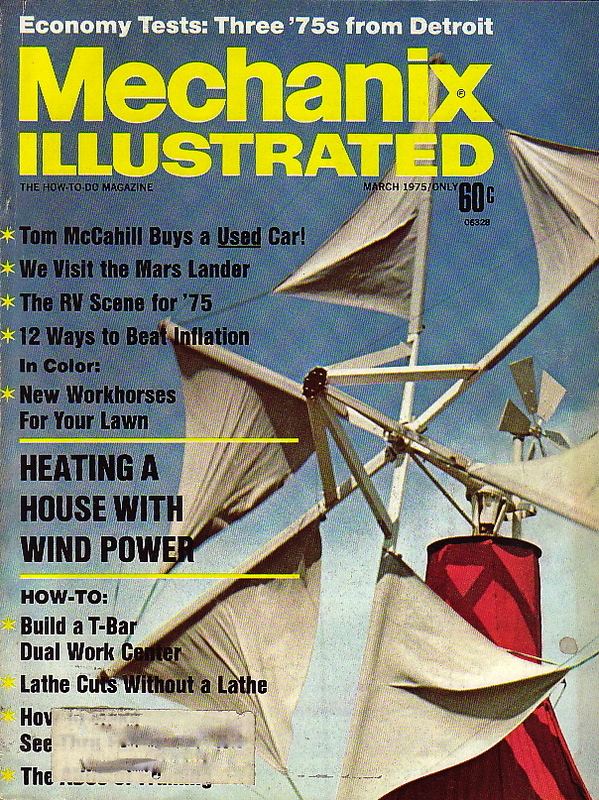 One of my favorite magazines to skim through at vintage bookstores is Mechanix Illustrated — a now-defunct Popular Science/Mechanics-style periodical that oozes with charming nostalgia. On a recent store visit, a headline about the Mars Lander caught my eye, as I’ve recently been monitoring the upcoming Curiosity rover’s approach to Mars. I plunked down 50 cents and headed home to read the article. The write-up is fascinating piece of 37 year old history. It shows our uncertainty about the unknown Martian world that we were preparing to land on for the first time. It also gave an overview of Vikings I and II, stationary research platforms that were highly advanced for their time, but a far cry from the mobility and power that the latest Mars rover, Curiosity, is taking to the red planet. On Sunday night, 10:31pm PT, Curiosity will enter the Martian atmosphere and begin its descent to the surface. Using a new landing technique called the Sky Crane, it will hover above the surface and lower itself down on a cable hoist. Its array of cameras, digging tools and high powered lasers are unprecedented, but the mission remains largely the same as from our first visit: to look for signs that the planet might have been able to support life at some point. If you haven’t yet, make sure to immerse yourself in the NASA site about the Mars Science Laboratory (MSL) to watch the progress of Curiosity’s approach and attempt to land. I’m thrilled about this, and, I have to brag, I’m thrilled that I will get to be at JPL to watch the scientists track the final descent. More Harbor Freight online coupons, to save you a ton of money on their weirdly low tool prices – sometimes concerningly low (remember, “you get what you pay for”). Take advantage by printing the best ones before you drive to your nearest location, or have stuff shipped if you don’t live near one of HF’s many stores. So what’s the story? Harbor Freight sends out at least two coupon mailings each month – their general monthly specials, and a batch of coupons for members on their coupon mailing list (which seems to expire if you don’t use it often enough). Often times the coupons’ discounts are significantly deep, so this is a good list to be on for those with a penchant for dirt-cheap tools. I had missed one of the big Harbor Freight sales last weekend, but needed some project supplies (at their prices, the tools are useful for repurposing into unrelated projects – palm sanders make great vibration tools for helping settle concrete). I checked the HF site to see what general specials they’re running this month, but wasn’t blown away; after being on the mailing list for a while you start to get an idea of what the real prices you should pay for these tools. Still hungry to save some money, I did a searched online a bit and found something interesting: pages and pages of printable coupons – the member’s stuff, the “Inside Track” stuff, and more. Each grouping I found has its own batch of items, and there were a variety of useful deals for most of the things on my list. I didn’t want to print out each page’s full list of coupons (taking about 6 pages of regular printer paper per group), so I copied the coupons I needed and pasted the image of them into a Word document. Six coupons, two pages, and I was ready to shop. I spent $69 and got two bags of tools and supplies; I’ve got 90 days to think about how much I need them and decide if a return is needed. These sections seem to be used and updated monthly for their common specials — if you’re going tool shopping, check these before you leave and print out what you need. They almost always have a 20% off coupon, in case the specific item you need doesn’t have a coupon that month – and make sure to bring the free flashlight coupon too. Now, to just get them to stop requiring a print out. It’s wasteful, and most companies these days let customers scan the image from their smartphone.